This recipe was adapted from the Robin Hood Sherwood Oat Chocolate Chip Cookie recipe published previously. Cream together shortening, sugars, and peanut butter. Add eggs, sourdough and water. Mix well. Mix in flour and baking soda. Stir in chips and peanuts. Roll into small balls and place on greased cookie sheets. Press flat with a fork. Bake at 350F for about 10 minutes. Makes about 4 dozen cookies. Hello! We just came across your recipe for sourdough peanut butter cookies and thought we would extend an invitation for you to join our monthly baking group. 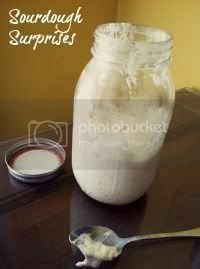 We are called Sourdough Surprises, and each month we find fun and unique ways to use our starters. This month we are featuring cookies, and we would love for you to join us!